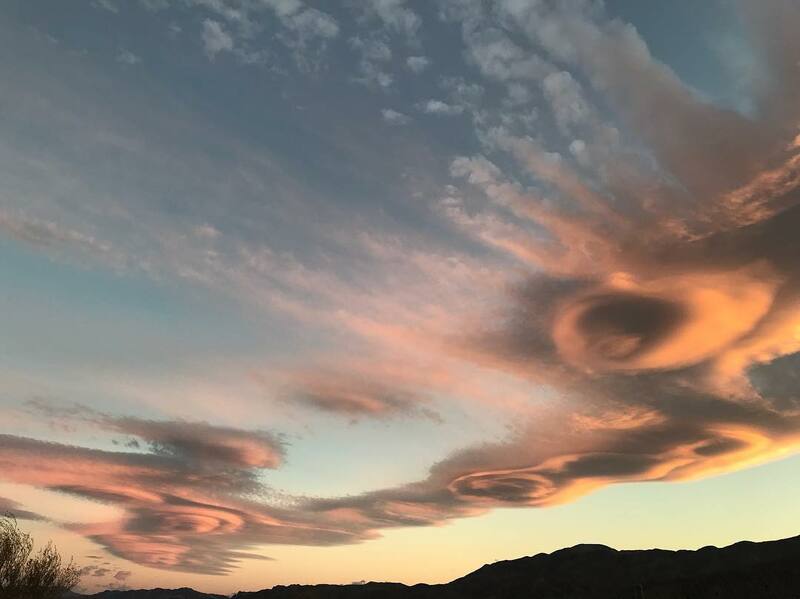 They are some seriously weird looking clouds. 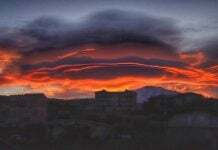 Sometimes likened to UFOs, lenticular clouds are usually created by gravity waves. 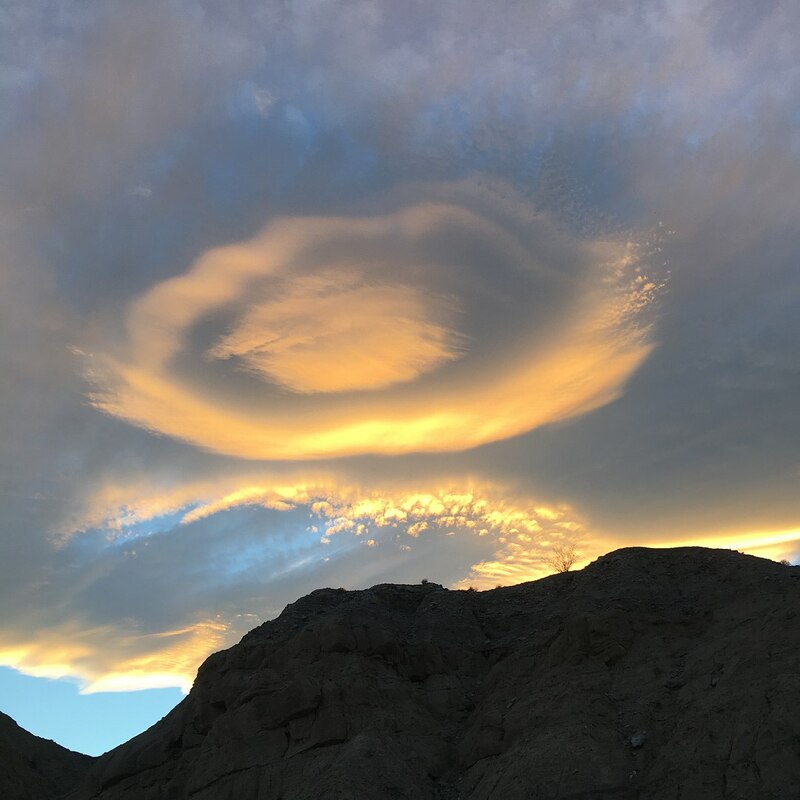 And when the last sunset rays shine right on them, they really look like something out of this world like in these pictures captured over Anza-Borrego-Desert State Park in Colorado Desert of Southern California on April 8, 2018. Named for their smooth, lentil-like appearance, altocumulus lenticularis clouds are believed to be one of the most common explanations for UFO sightings. These spooky forms appear downwind of mountains. When moving air encounters an obstacle like a mountain, it is forced to rise up and over it. As the air spills over the other side, the pull of gravity causes it to overshoot a little before resurging back up. It’s a bit like a car’s suspension bouncing after hitting a speed bump. 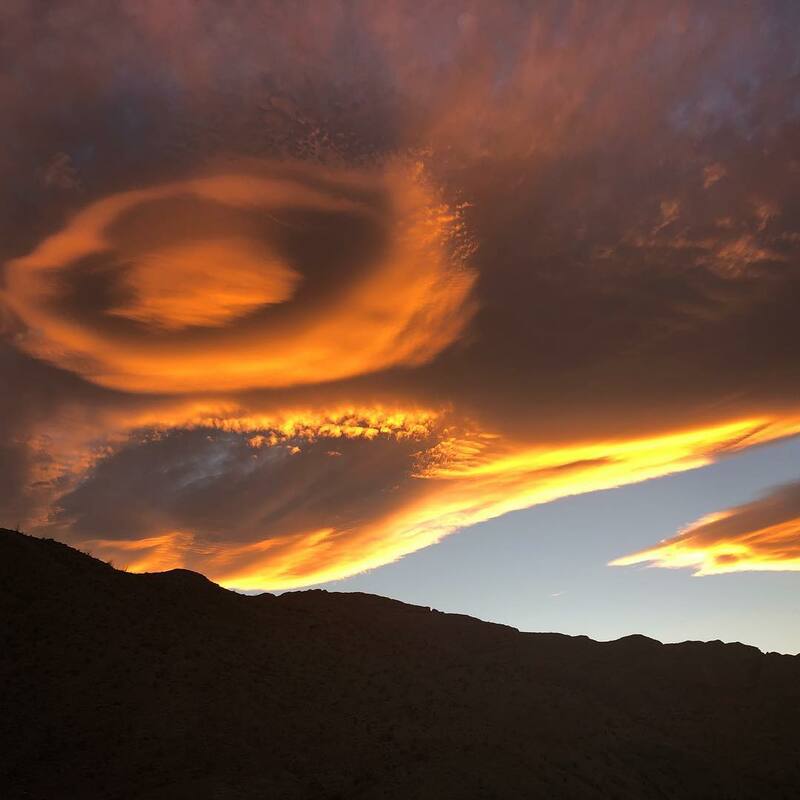 A stable air mass will continue to rise and dip for a little while as it travels away from the mountain, setting up an invisible “standing wave”. 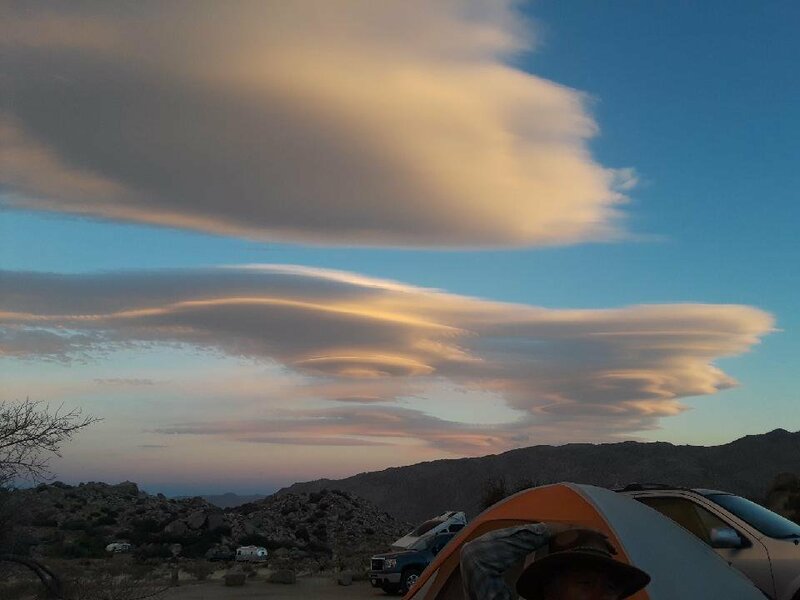 Lenticular clouds form when the airflow streaming over the mountain is both stable and humid. As it flows upwards and cools, the moisture in the air condenses to form clouds at the crests of the standing wave. 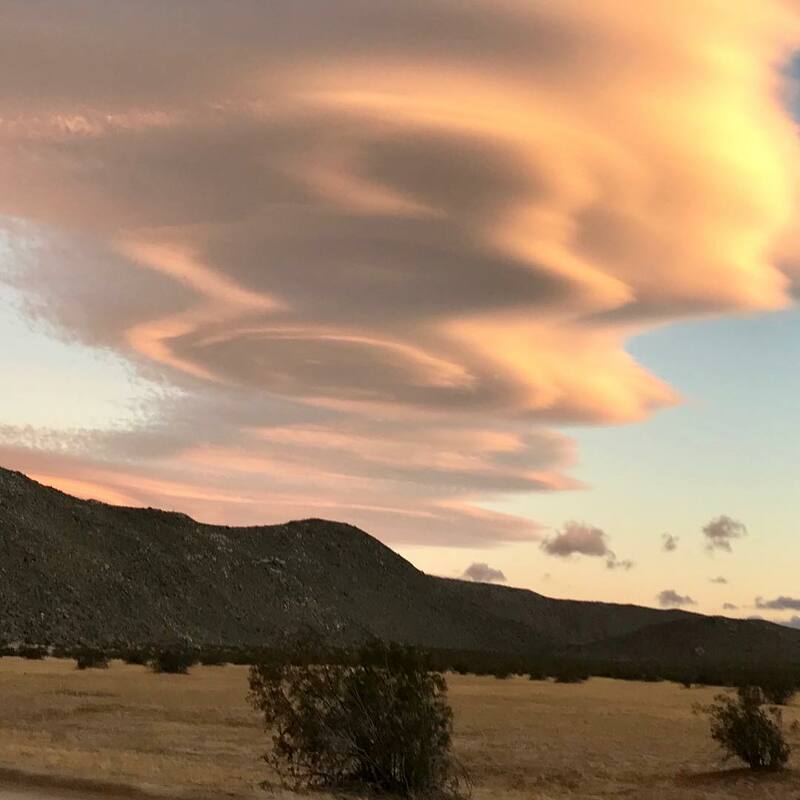 Lenticular clouds can also be caused by other speed bumps, such as tall thunderclouds, but because they often form on the downwind sides of mountains, they are also known as lee clouds, wave clouds or lee wave clouds. 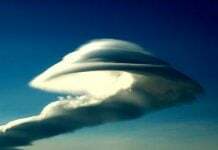 A lenticular cloud is one of my favorite cloud formation. What are your favorite clouds? 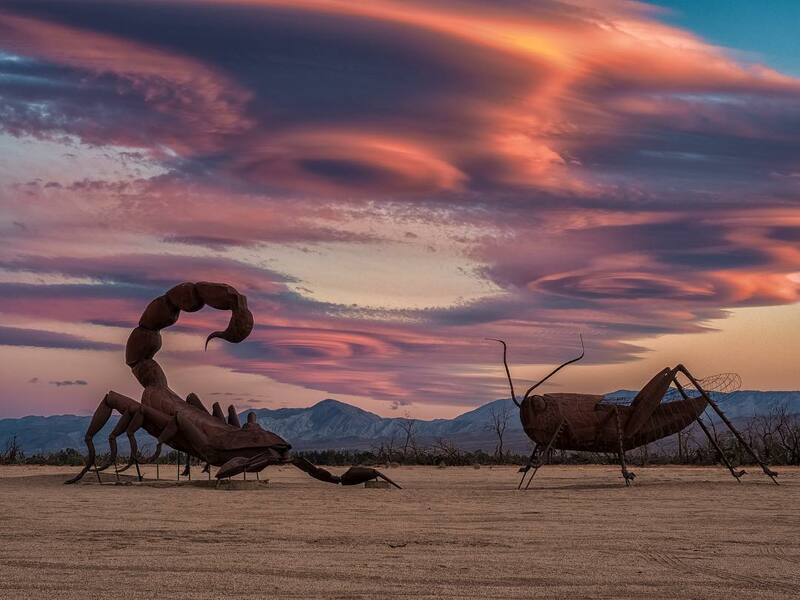 Anza-Borrego Desert State Park in Colorado Desert in California has a huge reptilians secret underground base. These UFOs are there to clean up the reptilian underground base. 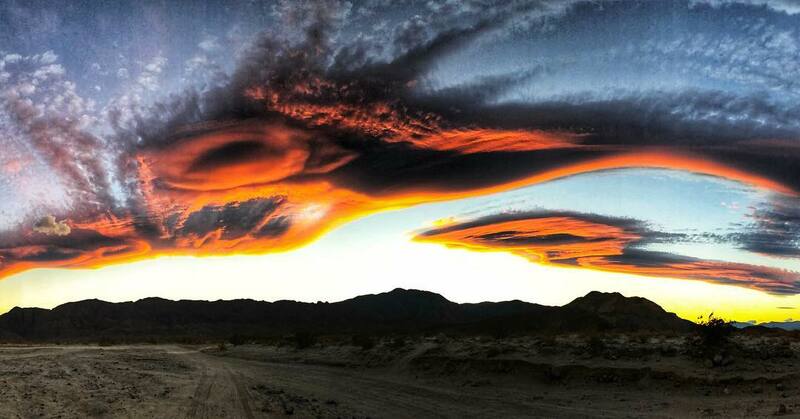 Anza-Borrego Desert has also high mountains where there are also the secret reptilian bases. I have found an interesting video to share with you. 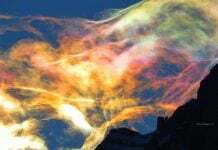 On the above the video, the first UFO has Directed Energy Weapon (DEW) beam to clean up the reptilian underground base. It looks like lightning. Recently whenever you see lightning, it is probably DEW from some spaceships. Then the last half of the video has some clips of teleportation. These reptilians do not have the right place to land on the Earth when they teleport themselves? Suddenly, they teleport themselves in the middle of the busy roads or highway? Human has soul. Soul will not die when body dies. Youtube: 5 Souls Caught Coming Out Of People! On the above the video, from 1:04 to 1:06, it looks like a guy, with some kind of sign, holding the soul and comforting. Please check by slowing down the video up to 0.25. If you want more info, there is another video. Youtube: 6 Clues That The Human Soul ACTUALLY Exist! How people reincarnate? If you cannot graduate 3rd dimension, you have to reincarnate into this world again to learn more things that you could not in the last life time. The reptilian entity, operating religions including Christianity, does not want to you to graduate this dimension. They want to keep you as their slaves in 3rd dimension where they are dominating. All the religions have been created by them so that you cannot graduate this dimension to the upper dimensions. You have to reincarnate again because you are fed all the false information and brainwashed by them. What you have to do is just get out of the religion created by the reptilian entities. Who needs the middle man who try to consume your money (their church demand 10% of your income? ), energy and time? Just get rid of those middle men, and directly connect to the higher dimension people whom you can call gods. They are waiting for you high above the sky or higher dimensions just above the 3rd dimension. Even if you cannot graduate 3rd dimension, your actions in this life time is very important for your future reincarnation. If your actions are quite good, your next reincarnation life might be easy and better. But if not, your next reincarnation life must be really tough. Salusa, the commander of Galactic Federation of Light told me “The people who were very rich in the last life time have been now reincarnated in poor countries in Africa.” It looks like that people with big money have the big responsibility to spend the money right way. Otherwise, next life time will be very poor to learn “Poorness”. A Crazy Jew set the fire on Trump Tower in NY? It is amazing that the fire did not spread very much on Trump Tower. I thought the fire become “Tower Inferno”. Trump knows this Jewish guy who set the fire and died. A series of big earthquakes including M6.1 in Japan were caused by the cleaning operation of Galactic Federation of Light. I checked the epicenters. There are some huge quarries ( reptilian underground base construction sites and entrances) around the epicenters. There are also tunnels (=reptilian underground bases). But miraculously there is no major damage. At 3:03, you can see the UFO show time! This kind of event will increase so that everybody can see the UFO dancing. Recently, there are so many sinkholes opening suddenly. News tells you that sinkholes are natural phenomena. But actually, opening sinkholes means attacks from high above. Yes, Galactic Federation of Light can create sinkholes to catch bad guys. Ancient curving ( in Egypt) depicting the ancient microwave or some kind of giant cooking wear to cook humans. On the above video, at 4:20, you can see the curving depicting some kind of giant cooking wear (an ancient microwave?). There are 3 people in it. Beside it, there is a big reptilian alien (or more like amphibian alien?). His hands have knives. He is almost saying “Bon a petite!”. 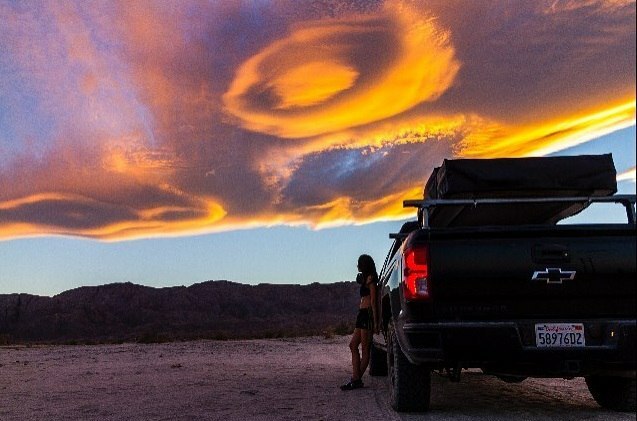 Just to clarify – Anza Borrego State Park is in CALIFORNIA, not Colorado. I go out there in the spring for the wildflower display. Yes sorry for that! I have corrected the post! Thank you! Anza Borrego State Park is in California. OOOps! Shame on me. Sorry for that! I have corrected the post! Thank you!